What started as a sweet indul­gence has turned into a lifestyle for Sandra Hakim of Baseema Choco­late in New York. Born in Baghdad and immigrating to the U.S. and liv­ing in Detroit, California and New York, Hakim shares she has always had a sweet tooth. “My family is all obsessed with deserts and chocolate. When I was young, my parents would travel to the U.S. and bring back American or European chocolate, so I grew up eating that.” That sense of familiarity and comfort was what led her to Baseema Chocolate. Working as a makeup artist for the fashion industry for more than a decade, Hakim decided to make a ca­reer change and follow her passion of food into something a little sweeter. She attended the Natural Gourmet Institute in New York and figured out that pastry, dessert and choco­late were her specialty because of her deep love of chocolate. 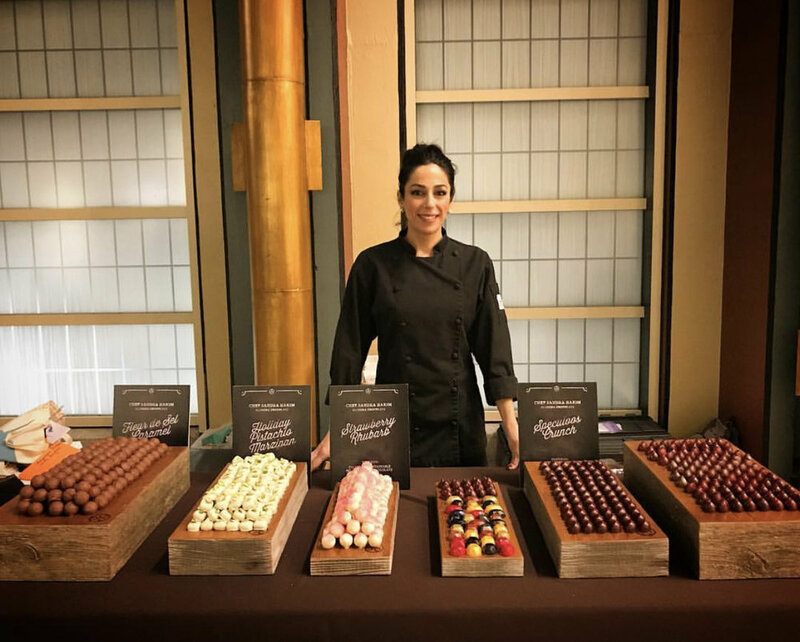 She took a leap of faith and went on to study European pastry and chocolate at DCT University in Switzerland, as well as at Ecole du Grand Chocolat Valrhona, working with master chocolatier Luc Eyriey. During her time in Switzerland, she graduated with the highest honors and was the first to graduate with a 4.0 GPA and won two showpiece awards. This was when she knew she was on the right path. She then interned with noteworthy brands in the industry like leading French lux­ury bakery, Ladurée. Driven by her success and with years of experience under her belt, Hakim started to make chocolate out of her apartment, giving it out to her local coffee shop and friends. People enjoyed it so much, they started ask­ing where they could buy it, and she began to take more and more orders from home. Hakim went on to share a kitchen in Brooklyn, and five years later, Baseema Chocolate is boom­ing, and often gets asked to cater events and pop ups for major design­ers like Ted Baker and Scotch & Soda. Most of her customers find her through word of mouth – the choco­late speaks for itself. Hakim makes it a point to source the best quality ingredients she can find. She imports chocolate from Switzerland, matcha from Japan, and natural vanilla from Madagas­car or Tahiti. Handpicking each ingredient, she makes sure they are sustainable and bought at fair trade and pure, kosher and GMO free. She won an award for her char­coal and matcha truffle and loves trying new things. One of her favor­ites is a chai and cardamom (heil) truffle she makes for her family. With deep devotion, she shares that after eight years, it feels like she has just started doing this for the very first time. With a small team of three, ev­erything at Baseema Chocolate is handmade and handcrafted. “It’s not easy but I love it and I chose to do it. I came from a line of entrepreneurs and followed in their footsteps,” she says. Dedicated to giving back, she also runs a nonprofit organization to rebuild Christian villages in Iraq. “Chocolate has a sweet place in my heart. It’s my real passion,” she says.